We're proud to introduce plans for our version of the classic Cider Press. 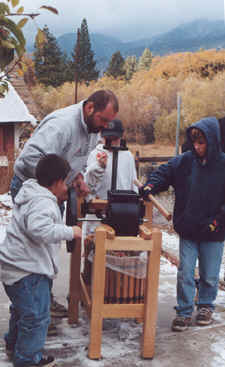 Using the grinder and screw assemblies from Happy Valley Ranch, our cider press has been reinforced and tested to be kid-proof for your most grueling applications. 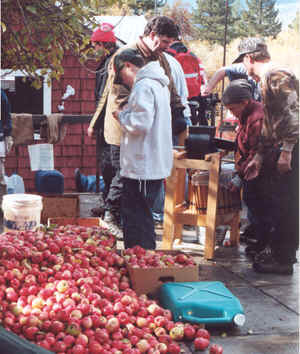 A beautiful machine in its own right, the Kuffel Creek Cider Press will make short work of your apples, producing gallons of fresh, delicious cider year after year. You will spend around $400 for the machine components, so protect your investment with a sound design and a good set of plans. Our plans are the best in the industry, and will allow the craftsman with moderate woodworking experience to easily build a machine that will become a family heirloom. 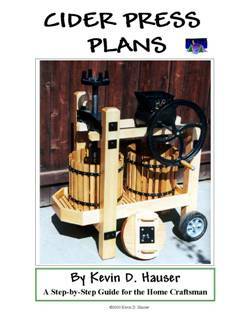 The plans include detailed instructions and are profusely illustrated with drawings and color photos, with a special section on cutting dovetails by hand. 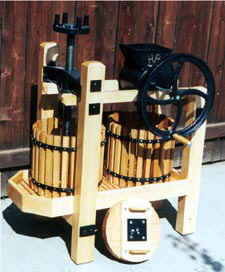 If you've ever contemplated having your own cider press, building your own can be the most rewarding experience. The book has (23) 8.5 x 11 pages with full-color illustrations, drawings, and diagrams. Offered in a .pdf download version that you can copy, save, and print just like any other file; 5MB file size.